The outfit consists of four pieces – dress, long coat, bolero jacket and shawl. Originally worn for any occasion, this outfit would now primarily be worn on happy occasions. The dress (krass) was very fashionable in the 1960’s. The fabric is called Jadie-Taran and has a slight shimmer. The sleeves are long with a triangle shape. The short black bolero (Yalak) is usually made of velvet. 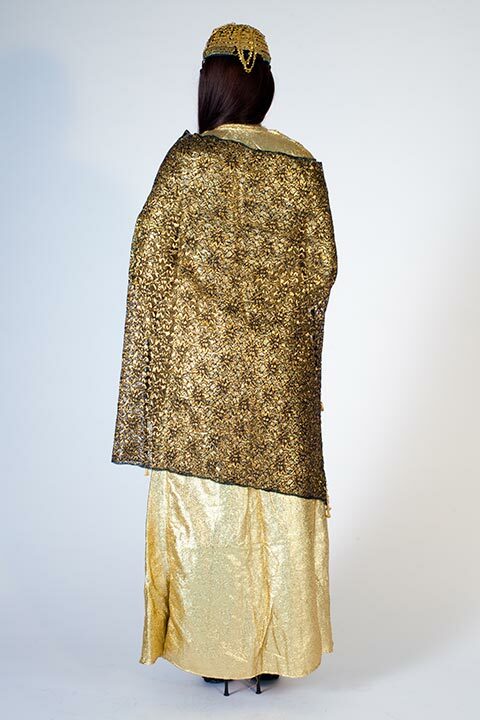 The long coat (Kawa) is made from a gold fabric called surma and was also fashionable in the 1960s and 1970s. The shawl (Charoka) pictured is approximately 60 years old. The gold fringe decorating the edges is called Gulang or Qazzaz and is handmade. The headgear (Klaw-zarr) is composed of a black hat (Faisa) covered with silver or gold coins and decorated with coral pendants on both temples. The chin strap (Jear-Channa) is made of coins. Chin straps may also be made from semi precious stones or beads. The gold belt shown is called Pishtweni-Qoba. The version shown here is a smaller kind, versions are also made with larger half circles. The belt may also be made from silver. The necklace shown here is called a Milla-Shillan and is made of gold and semi-precious stones or coral. Mountainous region, on the border between Iraq and Iran. Speak Kurdish dialect called Hawrami. The area is famous for growing walnuts and an oak tree (Snornba).